Ceramic Break is a sculpture park located on a pastoral property in northern New South Wales, 15 km from the town of Warialda on the Bingara Road or 25 km from the town of Bingara on the Warialda Road. This area of NSW and southern Queensland is known as the borderline region. Ceramic Break is about 150 km directly south of Texas, QLD. The name Ceramic Break refers to a place in the sculpture park where people are encouraged to bring a ceramic and break it, as a way of participating in creating an art work. Open: Thursday to Sunday, 10 am - 5pm, from March 1st until Mid December or by appointment. Ceramic Break Sculpture Park maybe closed if it is too wet. The Sculpture Park is about an hour drive from Moree and Inverell, or two hours from Armidale or Tamworth. It is a convenient 7 hour drive from Sydney, 5 ½ hours from Brisbane. or 14 from Melbourne. The nearest airport is Moree with a daily service from Sydney. There is also a “countrylink” train from Sydney Central to Tamworth and onto Moree. Or a bus meets the train in Tamworth and goes directly to Bingara or Warialda. 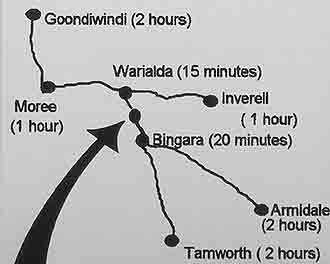 Countrylink, with the bus connection, takes 9 hours from Sydney to Warialda. Car rental facilities are available in Tamworth and Moree. There are many motels in Moree, some close to the famous hot springs. Bingara and Warialda both have a campground, a motel and pub accommodation.